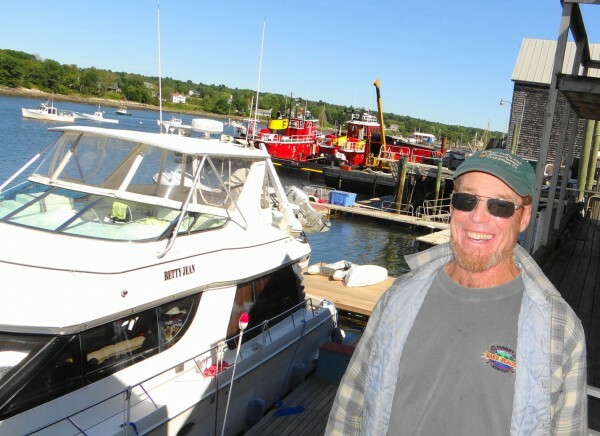 Alex Turner, who has owned and operated the Belfast Boatyard for over 30 years, has sold the business to the adjacent Front Street Shipyard. Turner will retire. BELFAST, Maine — Alex Turner remembers a scathing indictment of Belfast’s harbor made back in the early 1980s. Mike Hurley, a local business owner who now serves on the City Council, had purchased a boat. Curious about the lack of activity on the waterfront, Hurley encountered a man who operated a passenger schooner out of Castine. Ever the Belfast booster, Hurley asked him why the boat didn’t visit the city. “Belfast? Why would I visit that two-bit, burned-out, scum hole of a harbor?” the captain asked. Turner grins as he recites the quote, which must have been repeated around the waterfront often enough to be cemented into local lore. But today, the joke’s on those who wrote off Belfast. Turner, 64, has operated the Belfast Boatyard since the late 1970s. This month, he closed on the sale of the business to the Front Street Shipyard, the high-end yacht maintenance, repair and storage business that opened in Belfast last year adjacent to Turner’s yard. From the early 1970s, when Turner first arrived on the waterfront, to today, the harbor has been transformed. Turner had a front-row seat to witness what went right. Sitting on the bulkhead with his back to the water on a sunny afternoon, Turner recounted how he ended up spending nearly 40 years there. A few years after graduating from Bowdoin College in 1970, the Providence, R.I., native moved to the Waldo County town of Monroe, where he raised pigs. To supplement his income, Turner began working at a boatyard in Winterport. Then he worked one summer for local entrepreneur Jerry Savitz, who at the time had a combination boat chandlery, lobster pound and hamburger stand on the waterfront. In 1978, Savitz encouraged Turner to buy the boat yard part of the business, which operated on land owned by local businessman John Holmes. “It was pretty basic,” he recalled of the facilities. And as far as maritime activity, well, “There was nothing,” Turner said. He listed the names of a handful of lobstermen and others who moored their boats in the harbor, which, as the schooner captain observed, was nothing to brag about. “It was just too nasty,” Turner said, explaining why no pleasure boats moored in Belfast. Two poultry processing plants dumped waste in the harbor, as did a sardine packing plant. He remembers City Hall staff asking him if he wanted to lease the 15 moorings that Savitz had leased — at $5 each for the season — and Turner practically laughed at the notion of needing that many. When he did need another mooring, Turner did some bartering with a local man. “I traded him half a pig for his mooring,” he recalled. Today, there are 350 active moorings in the harbor, most for pleasure craft. The Belfast Boatyard owns 20 moorings and four harbor floats. The boatyard grew with the harbor, providing a wide range of services for boat owners. Mike Rauch, who has chaired the city’s harbor committee for more than 20 years, says Turner’s business helped the harbor grow. JB Turner, president of Front Street Shipyard, said there long had been people who liked Belfast and wanted to cruise from there, and that Turner provided the services that began making it possible. “He provided a great service to an area that had always been part of a maritime tradition,” but it had been eclipsed by poultry plants and other industry, he said. “I learned as I went, and a lot of people were willing to help me.” New buildings were constructed, hydraulic trailers were built and an additional inland storage yard was established. Major repair and upgrade projects were done in the winter months, Turner said, such as replacing a boat’s engine or fixing a hole in a fiberglass hull. In early spring, painting and cleaning boat bottoms is done. By May 1, launching begins, along with changing engine fluids and filters, batteries, and “stepping” or setting masts. “After the Fourth of July, you’re launchings cut back,” and the yard turns to repairing boats that are in use, fixing leaky holding tanks, repairing balky sail furling devices and engines that won’t run. “You’re doing it all,” he said. Sometimes, it’s crisis work, such as when a boat sinks or runs aground, or, like last September, when a hurricane threatened the coast and the boatyard took 38 boats out of the water in a 36-hour period. “That’s a lot of hard work,” Turner said. In the fall, engines are winterized, masts stepped down and boats are hauled out, stored at the boatyard and delivered to homes. Last year, the boatyard took care of about 175 boats. The forces that changed the harbor, Turner believes, were many. The poultry plants closed in 1980 and 1988. Credit-card lender MBNA moved to town, purchased one of the plants and turned it into a park. French & Webb, a company that specializes in fine woodwork for yacht interiors, moved to town. By the late 1990s, owners of expensive boats were no longer embarrassed to bring their friends to Belfast to board their vessels. Though changes have been occurring for the last 30 years, Paul Doody, board president of the Belfast Area Chamber of Commerce, said the most significant changes he has seen in the town have occurred over the last five years, with an influx of small-business owners to the downtown. And most recently, Front Street Shipyard bought a large stretch of the waterfront adjacent to Turner’s business, and its yacht-servicing business is booming. “It’s tremendous for the waterfront. And it’s exciting because of the scale,” he said of Front Street. For Turner, though, it’s time to step away from the now-busy waterfront. BDN Business Editor Whit Richardson contributed to this report.